My grandfather had 8 siblings and one of them was Aunty Sadie. She was the most delightful lady. Full of mischief and happiness. 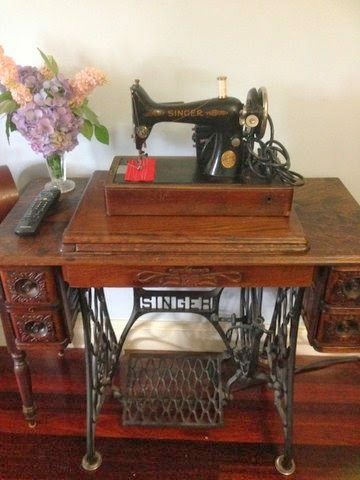 When Aunty Sadie passed away I was given this sewing machine by her daughter. I believe it was purchased in the first half of the 20th Century. It needs a little TLC to restore it to its former glory but it still sews a perfect stitch. The cabinet it sits on was found in my in laws garage in very bad condition. It was my husband’s great grandmothers. Now restored, it sits harmoniously with the machine in my living room. It is so nice to see something with ‘Manufactured in Great Britain’ etched into the body of the sewing machine. Does anyone know about this particular model? I would love to hear about your old Singer machines and their histories. *** Update *** Thanks to my readers providing some handy links, I discovered it was made in the factory Kilbowie, Clydebank, Scotland in 1945. Oooh Jane what a lovely machine you have there!!! I have a couple of old Singers too and I love them. If you go on to the Singer site you can type in the serial number of your machine and find out when and where it was made. A lot of the old ones were manufactured in Scotland … mine were. Interesting to find out a little bit of history :). Hello Jane, how wonderful to receive a family heirloom. If you Google Singer machines, they have a listing of the machine numbers with the year & place of manufacture. My hubby bought one on eBay for me, we then found that it had been manufactured in Glasgow in the year of my late fathers birth! Take care…..Annette, Lilydale, Melb. What a beautiful couple of bits of history. They will be well loved by you. 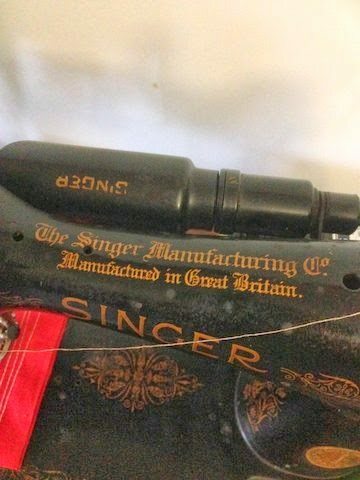 it looks like a Singer model 99–you can look it up by serial number on the singer website. they are usually right and can give you it's "birthday" too. Oh very nice. I have a wonderful treadle but can't figure out how to wind the bobbin, when I do it will be a most used machine! 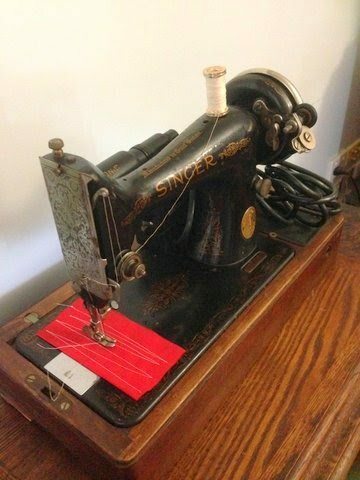 I have a Singer 201k that dates to 1947. It was my grandmother's machine and it still stitches perfectly to this day. It made my wedding dress, clothes for me and my boys, curtains for my home and was the machine that my five year old son learned to sew on (when he was still four). I still use it relatively frequently, even though I bought a modern Brother machine three years ago for my day-to-day sewing. I will always love my Singer and will continue to use it as much as I can and especially for quilting. What a lovely machine. How special that you have you're Aunt Sadie's sewing machine sitting on you're husband's great grandmother's cabinet. 🙂 I have a Singer Feather Weight 221 made in 1947. I purchased her a few years ago from a gentleman who was selling his wives sewing machines after she passed away. She took very good care of all of her machines. She purchased the feather weight in the early 1950's second hand & made her children's clothes and quilts with this little machine. Her husband had some of her quilts displayed in the living room too. This little singer sews a fabulous 1/4" seam. Last year my husband surprised me with a Singer 301, from the 1950's. I use both of theses machines to make all of my quilts. Another plus is that they use the same bobbins, can share foot petals if need be (I've had to replace both foot petals), the bobbin holders are the same and fit both machines. Really nice. I've been thinking about getting a vintage machine but probably not a treadle since it would take up so much space.